LAS VEGAS (Friday, January 29, 2016) – Defending champion Bob Neumeier of NBC Sports tops a field of 44 celebrities and media types competing in Saturday’s second annual $10,000 NHC Charity Challenge to benefit the Old Friends Barn Raising Project, Thoroughbred Aftercare Alliance and a nonprofit cause of the winner’s choice. The invitation-only online tournament is held on the final day of the Daily Racing Form/NTRA National Handicapping Championship Presented by Racetrack Television Network and Treasure Island Las Vegas. Thoroughbred-loving celebrities participating include actress and model Bo Derek and ESPN College GameDay personality Chris “The Bear” Fallica. Other high-profile players include legendary track announcer Tom Durkin, retired jockey Ramon Dominguez and Tito’s Handcrafted Vodka founder Tito Beveridge (yes, that’s really his name). A few of racing’s favorite and most lovable non-human Twitter stars have also joined the fray – Juba the Gray (@JubaColt) and the Spa Infield Goose (@SaratogaGoose). A host of Thoroughbred racing broadcasters are among the field: Matt Bernier (handicapper), Larry Collmus (racecaller), Randy Moss (analyst) and Eddie Olczyk (handicapper) of NBC Sports; Caton Bredar and Christina Blacker of TVG; Zoe Cadman, the popular reporter and former jockey; and Aaron Vercruysse of Xpressbet. NHC title sponsor Daily Racing Form has five players, in addition to Bernier: editor and publisher emeritus Steve Crist, handicapper Dan Illman, national correspondent Jay Privman and national handicapper Mike Watchmaker. Racing’s print media also is represented by Frank Angst, Tom LaMarra and Claire Novak of The Blood-Horse, as well as Paulick Report founder and editor-in-chief Ray Paulick and editor Scott Jagow. Radio broadcasters include Steve Byk of At the Races with Steve Byk, as well as Acacia Courtney, Jude Feld and Mike Penna of Horse Racing Radio Network (HRRN). Recently retired five-time Eclipse Award winner Jennie Rees, attending the NHC as a member of the #NHC Social Media Team, will tweet her picks from @tracksidejennie. Multi-talented Thoroughbred racing ambassador Joe Kristufek of America’s Best Racing is yet another sharp handicapper and broadcaster in the field, as are Ed DeRosa of Brisnet and Dave Tuley of ESPN.com and the View From Vegas blog. Several track announcers and analysts are playing, including Christina Bossinakis and Ron Nicoletti of Gulfstream Park; Frank Mirahmadi of Golden Gate and Santa Anita; Brian Spencer of Fair Grounds; and Jill Byrne of Churchill Downs. NHC regulars in the field include Peter Rotondo Jr. of Breeders’ Cup Ltd. and the reality TV series Horseplayers, as well as 2001 NHC champ Judy Wagner and 2009 NHC Tour winner Bryan Wagner. Industry types who made their way into the mix are Merv Huber of Bet America and Lucky Kalanges of TwinSpires.com. Also making picks is friend of the NTRA John Morris, playing on behalf of the John Morris Foundation, which defrays medical expenses for the paralyzed son of The Stronach Group’s Joe Morris. Players will select one horse to Win and Place in seven races – one from each of the tracks available to players in the NHC. Using a “Pick and Pray” format, all selections are due Saturday morning and any scratches will result in the player being assigned the post-time favorite. The player with the highest hypothetical bankroll after the final contest race will be declared the winner. In the event of a tie, there will be no playoff; the donations will be split among the winners. CAL CUP PROVIDES THREE ‘FINAL TABLE’ RACES – Sunshine Millions/California Cup XXVI at Santa Anita Park on Saturday is highlighted by five stakes cumulatively worth $1 million. The 10-race extravaganza spotlighting California-bred and California-sired horses provides several deep and competitive wagering races that are natural fits for the NHC’s Final Table. The last three mandatory races of the Final Table that will ultimately decide who earns the $800,000 first prize and an Eclipse Award for Horseplayer of the Year are part of the Cal Cup Day card, including two of the Cal Cup stakes. Carded as races 7-9 at Santa Anita, those events are the $150,000 Sunshine Millions Filly & Mare Turf Sprint, featuring a full field of 14 on the downhill turf course at 3 p.m. (all times Pacific); an evenly matched nine-horse allowance/optional claimer for older Cal-bred sprinters at 3:30; and the featured $250,000 Cal Cup Classic with 13 of the top turf horses bred in the Golden State, the NHC’s grand finale, at 4 p.m.
“The NHC Final Table is the ultimate test of a horseplayer’s ability and the combination of quality horses with large and competitive fields offered by the Cal Cup provides us with handicapping puzzles appropriate for the occasion,” said NTRA Chief Operating Officer and NHC Tournament Director Keith Chamblin. Post time for the Cal Cup card is Noon. As an official NHC partner, the entire Cal Cup program will be showcased Saturday in the Treasure Island ballroom that serves as NHC headquarters. SATURDAY SEMIFINALS RACE MENU AND FINAL TABLE MANDATORY LINEUP – Saturday’s menu of optional races for the Semifinals and lineup of seven mandatory races for the Final Table were announced Friday morning. The Semifinals menu of eligible tracks and race numbers (listed in order of first post time): Gulfstream 1-7, Aqueduct 1-7, Tampa Bay 1-7, Oaklawn 1-3, Fair Grounds 1-3 and Santa Anita 1-2. Players must wager on 10 these 29 races. The Semifinals will end at about 12:30 p.m. PT, at which time the top 10 entries advancing to that afternoon’s Final Table will be announced. The mandatory Final Table races (with estimated PT post time): Gulfstream 10 (1:35 p.m.), Fair Grounds 6 (1:54 p.m.); Oaklawn 7 (2:09 p.m.), Gulfstream 12 (2:35 p.m.), Santa Anita 7 (3 p.m.), Santa Anita 8 (3:30 p.m.) and Santa Anita 9 (4 p.m.). 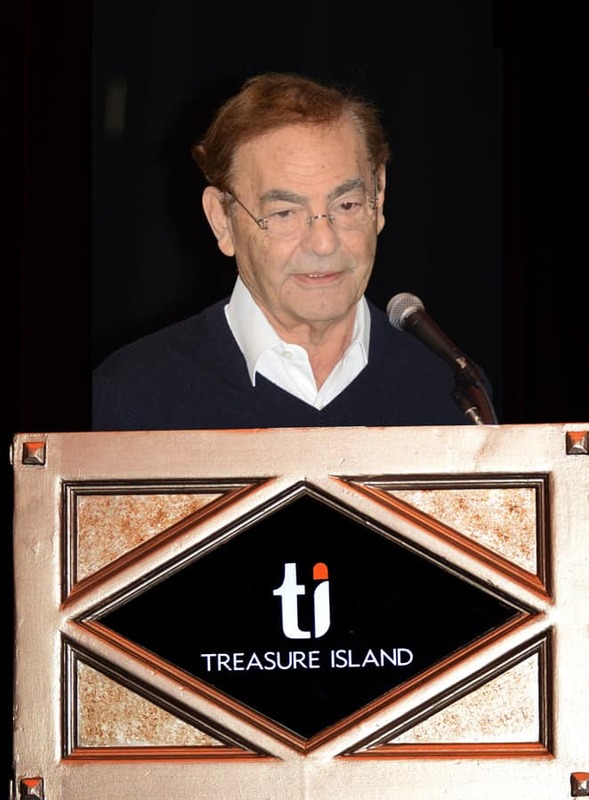 CASINO BOSS VISITS NHC – Treasure Island Hotel and Casino owner Phil Ruffin, the 80-year-old self-made billionaire originally from Wichita, Kansas, visited the TI Ballroom on Friday to greet the NHC players. Ruffin is a longtime horseplayer who purchased The Woodlands in Kansas City last year and is hoping to add slot machines that could help to revive the track. In March, Ruffin will make his first visit to the Dubai World Cup, the world’s richest horse race.